Psalm 127:3 states that "Children are a gift from the Lord..." What better way to care for the gifts God has given to you than by teaching them to love God's Word? 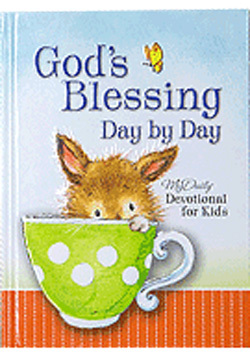 Debbie Schreve has contributed to a precious 52-week devotional book for children called GOD'S BLESSING DAY BY DAY. By using simple language and charming illustrations, this book will be invaluable in teaching your special gift the truths of the Bible in a way they can understand and serve as a blessing to the entire family.